I bet you thought I was going to talk about Thanksgiving. Nope. Too predictable. Instead, I have a very special gift for you. Today, I want to introduce you to Julie. She has been thinking about starting her own food blog, so help me encourage her with this baby step she’s making. Julie has actually been with me on my entire blogventure. We were in Paris together exactly 2 years ago when I met Clotilde Desoulier at a book signing and decided to start little cooking diary. We spent that night figuring out where we were going to spend the next 5 days and how to actually get there, with periodic breaks for me to gush about how excited I was to start a blog. We checked airlines, train schedules, and travel sites, finally formulating our plan at 3 am. We would take an overnight train from Paris to Berlin, spend the day and a night in Berlin, and then go to our main destination, Prague the next morning. Arriving in Berlin, we toured around, drank some beer (I know, me, beer! ), cancelled our hotel, and spent the night in a casino. We jumped on the early morning train, snoozed, and a few hours later, disembarked when we heard commotion in the aisle and the conductor shouting something in Czech (well, we assumed it was Czech). We found a taxi and showed the driver a printout of our hotel address. He loaded our luggage into his trunk and then started driving into a residential neighborhood in the mountains. We looked at each other in the back seat and shrugged; I mouthed to Julie, “I thought we were just a few minutes from downtown Prague.” Neither of us spoke Czech and our driver didn’t speak English (or Russian for that matter). The driver pulled up next to another car parked near the driveway of a house. A quick exchange of words with the driver of the parked car and our driver was gifted with a GPS. Again, Julie and I shrugged at each other. We started driving and driving and finally, from the back seat, we were able to inquire as to why this was taking so long. Turns out, we had managed to detrain right after we crossed the border into the Czech Republic, over an hour from Prague. Our driver returned us to the border station and refused our money. We took another train to the right stop this time. Prague was freezing. We went to the castle, the opera, the Alte-Neu synagogue. We ate venison (first time ever for me) in a restaurant just a few blocks from our hotel. We took a mini-cruise along the Vltava River. The prior year, Julie and I had spent the days leading up to Thanksgiving together in Amsterdam and Brussels. It seems Thanksgiving has become a bit of a tradition for us. This year, we are both in Miami with our families. I’m hoping Julie and her parents will come over for dessert. You know, I said this wouldn’t be a Thanksgiving post. But apparently it is. Thanks, Julie, for being a great friend and travel partner! I was asked to write a guest blog a while back by my friend, Gayle, and I procrastinated because I really didn’t know which dish to write about. I love food, and all cuisines—from the most complex and authentic to the simplest of dishes. Having a wide range of different dishes prepared by my mom, who is one of the best cooks I know, and by experiencing the cuisine of different countries through the travels I’ve done over the years, I’ve developed a special love for food. And of course, if there is an idea about a dish in my head, I always try to make it at home. As I was deciding on the menu for the blog post, I really wanted to combine something old and traditional with something new and fresh that I could relate to my every day life. Back in February, I was in Amsterdam for a friend’s wedding and was invited to one of the sheva brachot. The hostess informed everyone that she wasn’t going to be cooking much, just dunne pannekoeken, Dutch pancakes. I was very excited to try real traditional Dutch food. Finally, when she brought out a huge plate of what seemed to me a stock of typical Russian blini, I was pleasantly surprised to see a taste of home. “This is not Dutch,” I thought to myself, “these are Russian blini!” I grew up with blini, topped with caviar, lox, Nutella, jam or whatever other toppings you could think of. After seeing 30 Dutch people eating their Dutch dunne pannekoeken and folding them a different way, I realized that food is what binds us together; we may come from different corners of the world but we all eat the same food. The only difference is that we call it our own, and by our own names: blini, blintzes, crepes, or dunne pannekoeken. It’s that comfort food that is universal and loved by the whole world. This is the reason I chose to share the blini recipe with you, along with another episode from my life—that reminded me of my childhood—that would complement the Russian blinis. Blend all the ingredients, except for hot water, with a hand blender until smooth; add the hot water, mix everything well; add more water if needed to get the right smooth consistency. Heat up and grease a frying pan and pour a ladle full of batter into the center of the pan and quickly move the frying pan in a circular motion, so that the batter spreads evenly all around until it’s all set. Cook for a minute on each side or until brown. 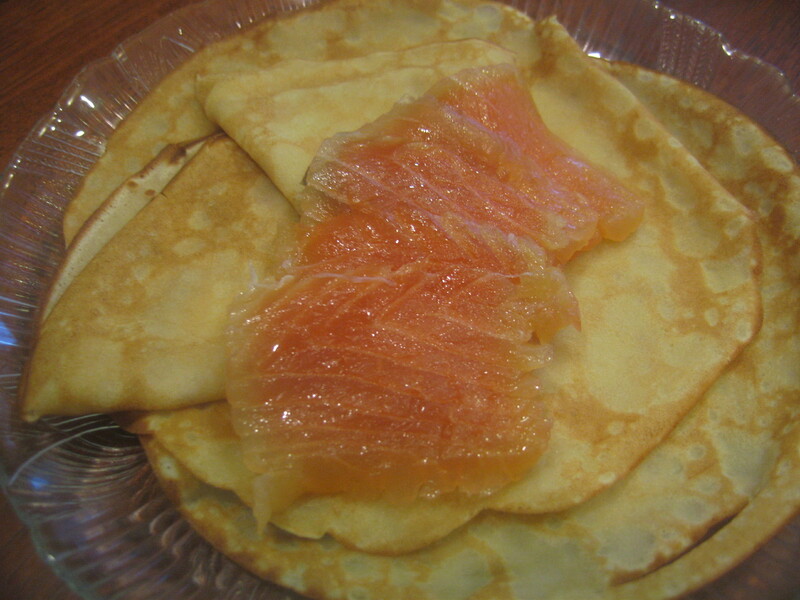 Now that you have the recipe for authentic Russian blinis, I would like to share a recipe for home-made lox fillet that you can eat along with your blinis. Recently, my mom’s friends were visiting from Canada and at one of the meals my mom served lox, one of the sisters said: “Why do you buy lox, it’s so much better to make it at home.” Huh?! Home-made lox? I thought lox was Scandinavian, and one of those foods that can only be bought, like canned tuna. And then I was quickly reminded that her father used to bring fresh and salted fish direct from the Caspian Sea and sell it in my hometown. I didn’t realize that he was the one salting the lox. It’s almost as if I could still taste of delicious, fresh, and juicy lox in my mouth from when I was about 10 years old. The recipe sounded simple, so I decided to try it—and it was too easy to make and too delicious to not continue making again and again. Take a fresh salmon fillet with the skin on, wash it, pat dry it with a paper towel and put it in a glass dish. Cover the fish with salt all around about 2mm (or if you use kosher salt I use 1 layer of salt all around). Cover with a lid and keep it on the bottom shelf of the refrigerator for 16-22 hours. Wash off the salt, pat the fish dry with a paper towel, dip the towel in some olive oil and smear it all around the fish. Slice fillet as you like and enjoy it with anything from a cracker to home-made blinis for Sunday brunch, or as a starter for Shabbat lunch. Enjoy! As I write this, I am gobbling down the best thrown-together dinner that I’ve made in a long long time. I just had to get it down on paper before it went the way of many of my other creations scrambled together in a hunger-induced frenzy. No pictures tonight because there’s no natural light and I’ve got to get packing for Thanksgiving. After walking in the door, I had a glass of wine in my hand before I even set my keys down on my table. Keys down, I grabbed a Diet Coke too. I had swiss chard in the fridge and nothing on my mind other than the need to feed my hungry belly. Hold, on. I need to go get seconds. I trolled around the web and turned to some tried and true sites because I didn’t have the time or patience to get creative. I found a recipe for sautéed swiss chard and one for spaghetti and swiss chard. With enough inspiration I set to work. I rough chopped a big bunch of chard and swirled it in a huge bowl of water a few times, rinsing until the water ran clear. I sautéed a chopped onion and a heaping tablespoon of garlic (right from the jar…classy, no?) in a tablespoon or so of olive oil. I put a pot of water on to boil. I cut the red stems from the leaves and threw them (the stems) in with the onion and garlic. I added a few tablespoons of the soon-to-be pasta water, covered the pan with my cutting board, and let it cook until the pot of water behind it started to boil. I threw a big pinch of salt into the water and added 3 handfuls of macaroni. I removed my cutting board cover from the pan, added the chard leaves to the stems and sprinkled on a few more tablespoons of the now pasta water. I covered the chard again. I checked my email. Nothing from my boss. That’s good. Two more minutes to go on the pasta and the chard is nice and wilted. I threw it in the same bowl I had washed it in, added salt and pepper and a few tablespoons of crumbled feta and stirred. As it melted, the feta turned pink from the red stems. My pasta timer went off. I poured the macaroni into a strainer and then straight into the bowl of chard. A few slices of butter, a final stir, and dinner was ready. Wow. My quickest post ever. 46 minutes flat. 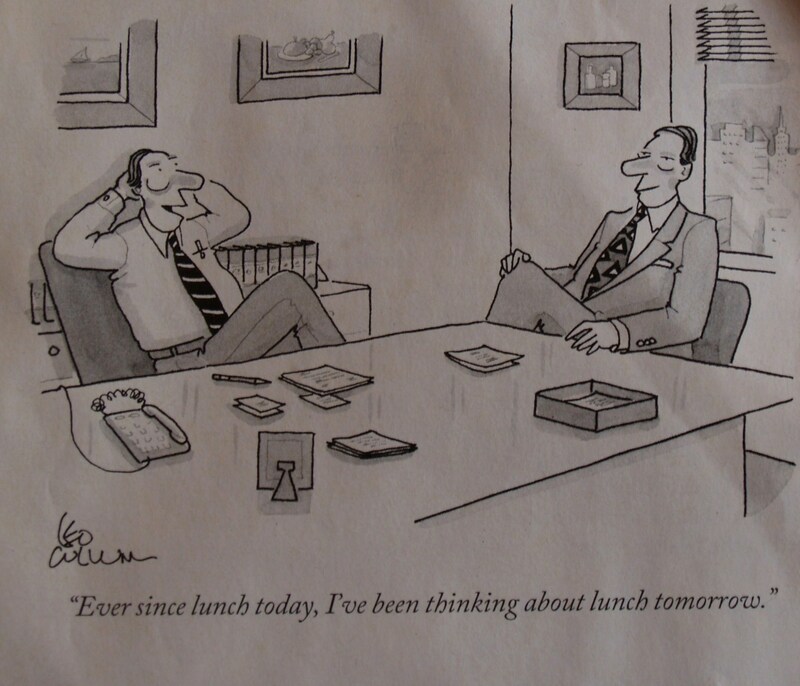 The best part – I have lunch for tomorrow. After Tokyo, I headed off to Paris for 4 days. Life’s tough, right? But I won’t share with you any pictures of Paris. Because I don’t have any of this culinary city. Crazy, no? Unfortunately I was swamped with work and by the time my meetings were over, I was too bone tired to really enjoy the city. A pity, but at least I know that I’ll be back again soon. Before I left for my around-the-world-in-two-weeks adventure, a publisher sent me a new cookbook to review. To me! The cookbook is Paula Shoyer’s The Kosher Baker and it contains over 150 parve dessert recipes. It was dog-eared and covered in yellow stickies well before I stepped on the airplane, and when I came home, I was inspired to try two recipes in as many weeks. Not surprisingly, I prioritized a few of the more French recipes. First was a batch of madeleines. (The last batch I made was tainted by the silicone pan that I made them in, so a few months ago I bought a new pan.) Next up, almond tuiles. Before we get to the recipes and pictures, I want to share with you a little about the book and its author. I spoke with Paula 2 weeks ago to learn about her inspiration for the book. Getting her on the phone took a fair bit of effort on both our parts, with her busy book signing and demonstration tour and my own crazy travel and work schedule. We finally caught up on a Thursday night as she was recovering from a cold and I was in a taxi en route to a 9 pm dinner after a long day in my New York office. Paula lives just a few miles from where I grew up in Maryland and she has quite an affinity for French foods and pastries. While living in Geneva with her husband, she decided to go to culinary school in Paris on a lark and built up a reputation for her desserts in Switzerland and eventually the US. She opened a pastry school and has been teaching French (and other) pastries and desserts ever since. She spent about 5 years creating and adapting from dairy the parve recipes in her own cookbook. She likens recipe development to science experiments and feels that baking requires close attention to the details of recipes. I asked Paula which recipe she turns to most often – and she referred me to “Everyone’s Favorite Chocolate Cake.” We bonded over the merits of an excellent chocolate cake that is so good it doesn’t require frosting. She also said that the scones often frequent her kitchen and table. The book itself is conversational – it feels like Paula is cooking alongside you, with comments such as “if you use an electric mixer, be careful, the batter might splatter.” I liked the organization of book into three distinct sections based on preparation time (quick and elegant desserts, two-step desserts, and multiple-step desserts and breads) and a fourth section on Passover and low-sugar recipes. The index is complete with the added touch of some specialty ingredients, such as almond flour and orange blossom, being highlighted with recipes that feature them. The pictures are beautiful, but I could do with a few more. And scattered throughout the text are some black and white process pictures (my favorite is the one used to demonstrate how to make sablé galettes – essentially French shortbread). Again, I wish there were more. On whole, I like the cookbook and have already found it a good resource. So below are the recipes that I made the week I came home from Paris. And I’m already bookmarking more recipes to try. I’ll soon be making sablé galettes and that chocolate cake. Adapted from Paula Shoyer’s The Kosher Baker. I followed the recipe, except I missed one step (in the “mix one more time” section). and used lemon extract instead of zest because I didn’t have any lemons around – and on day 2, the mads seemed a bit too dense. But straight out of the oven, they were fabulous (and that’s how I prefer to eat them anyway). Surprisingly, this recipe did not include a refrigeration step which is normally suggested to help get that little hump on the cakes. Finally and just so you’re prepared, this recipe does need a few bowls – so cleanup is a bit of a pain. But, hey, I really hate doing dishes. Mix. Beat the eggs with a mixer on low for 1 minute. Add sugar slowly, in four batches, while continuing to beat on low. Add vanilla and lemon zest (er, extract) and now beat on high for 5 minutes. The batter becomes thick, creamy, and a light yellow. Mix again. In a different bowl, mix flour and melted margarine with a wooden spoon until it becomes a dry paste. Mix one final time. Add half the beaten egg/sugar mix to the flour/margarine mix and whisk. Put half this mixture back into the eggs and mix with a spatula. Add the other half of the mixture to the eggs and mix. Bake. Fill each mold with a spoonful of batter and refrigerate the remainder. Bake for 12 minutes until a toothpick comes out clean. Cool. 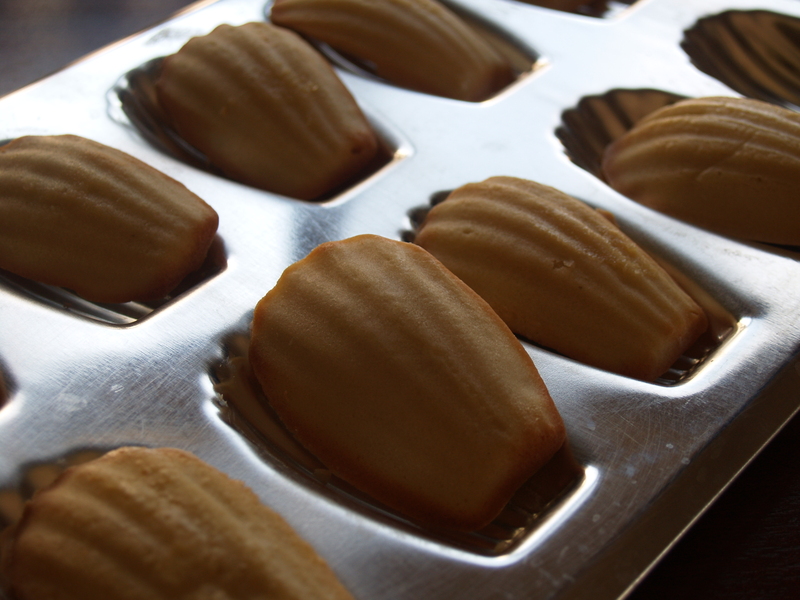 Immediately remove the madeleines from the pan to cool on a wire rack. Start all over again. Make sure to clean the molds out and then regrease/flour, fill, and bake the next batch. Adapted from Paula Shoyer’s The Parve Baker. These delicate cookies taste great. I had a bit of difficulty shaping them over my rolling pin, so next time I’ll use something with a smaller diameter. Mix. Whisk together egg whites, sugar and flour. Add the melted margarine and continue to whisk. Add zest and keep whisking. Add almonds and mix gently with a spatula, taking care not to break the nuts. Wait. Cover and refrigerate for 2 hours or ideally overnight. Bake. Preheat oven to 400°F. Cover a cookie sheet with Silpat or parchment. Drop teaspoons of batter on the sheet, about 4 inches apart. Use a fork dipped in water to spread batter and separate the nut slices. You want the circles to be about 3 inches in diameter. Thinner is better. (Cookies, that is.) Bake for 7-8 minutes or until the edges are brown and the center is golden . Shape and cool. Remove from oven and let cookies cool for about 15 seconds (if you try to take them off too soon, they fall apart). 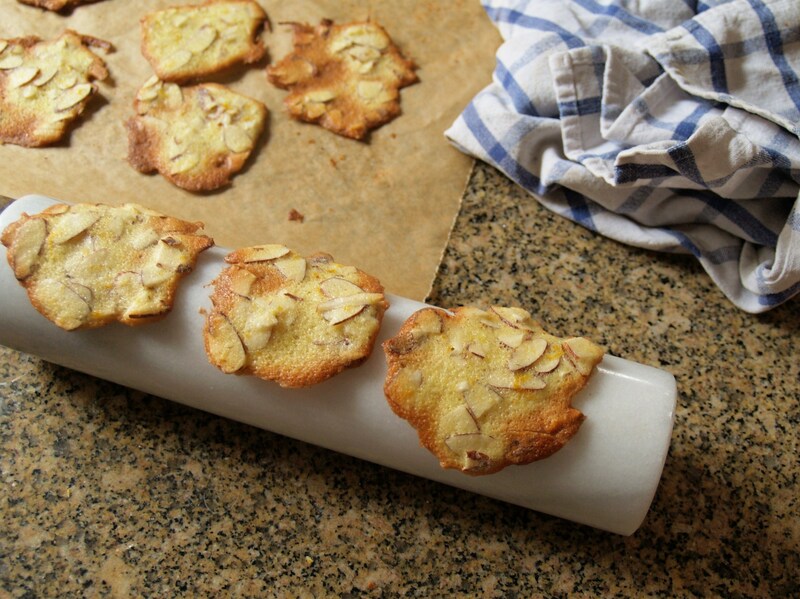 Use a spatula to scape up each cookie and quickly place on a curved mold – I used a rolling pin – so cookies bend on the underside (i.e., bottoms are on the rolling pin) and the almonds are on the outside. Let cool. Please tell me I’m not the only one who feels this way.